Microsoft’s Xbox division has began promoting their ‘New Xbox One Experience’ (NXOE) update, by sending out mailings to Xbox One account owners. Currently the NXOE update is only available to members of the Xbox preview program. According Microsoft’s Mike Ybarra, the update will be a work-in-progress until it launches in early November. “The New Xbox One Experience will be powered by Windows 10, elevating the gaming experience on Xbox One. 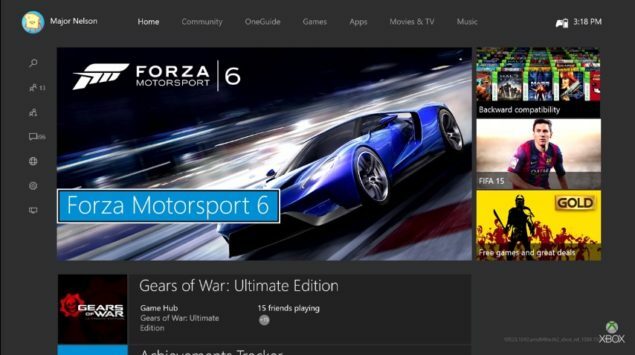 Integrating the speed of Windows 10, the New Xbox One Experience will get you to popular gaming features up to 50 percent faster”, said Ybarra on the Xbox Wire Website. Judging from early speed comparisons, the performance gain is even more than 50% compared to the current Xbox One interface. The NXOE is part of the integration of Windows 10 into the Xbox One, which will allow for an even better Xbox experience, according the mailing. The mailing from Microsoft doesn’t give any info on the actual release date of the NXOE update, but merely states “around the end of the year”. Back in September of this year though, Microsoft already confirmed that the update will be released in November. The November update also makes the Xbox One backwards compatible with an ever-growing library of 360 titles. Fans can request for certain titles to be added to the library, by submitting their feedback right here.